"Sampath Speaking" - the thoughts of an Insurer from Thiruvallikkeni: Kanum Pongal at Marina beach ..
Kanum Pongal at Marina beach .. The harvest festival Pongal brings cheer and happiness to everybody and in a City where the population has moved far away from its culture and tradition also the festivities are well celebrated. Today 17th Jan 2015 is Kanum Pongal. Most Shops & Establishments are closed as workers stay away enjoying their holiday with their families. 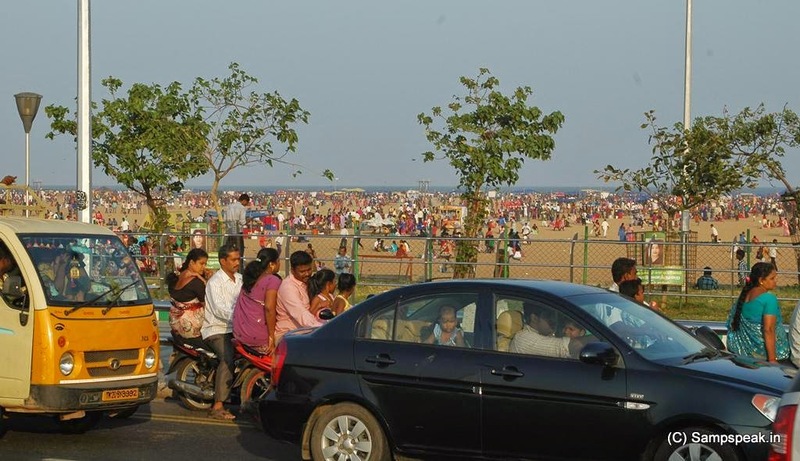 On “Kaanum Pongal’ day thousands throng the beaches of Marina. Other places like Exhibition grounds, Cinema halls, Vandalur Zoo and the like would also seen huge numbers coming. You can even see bullock carts, mini trucks and other forms of vehicles fully loaded with people who venture out so happily to enjoy the festival – be with the family, wear new clothes and dine happily. Marina beach is not safe and the Sea has taken the lives of many youngsters. The City Police have stepped up security on the Marina and Elliots beaches in view of Kaanum Pongal. Barricades have been erected preventing people from entering water and special podiums have been set equipped with public address system to take care of small children who wander away from their parents and relatives. Temporary watchtowers with public address systems have also been set up. The police have announced certain changes in the vehicular movement on Kamarajar Salai and some other roads to ensure free movement of people. In a new initiative, the City Police plan to attach bands around the wrists of children to help trace those missing. The bands, containing telephone numbers of their parents, will be provided to children below two at three child helpline booths on three service entry routes on the beach. Thousands will throng the Marina and will generate more than 25 tonnes of waste on Marina alone. The average amount of litter they generate has been increasing every year. More than one lakh people were estimated to have visited the Marina last year just on the Kaanum Pongal day. It is reported that more than 100 conservancy workers will be on their toes to clean the waste littered by people who visit the beach on Saturday. 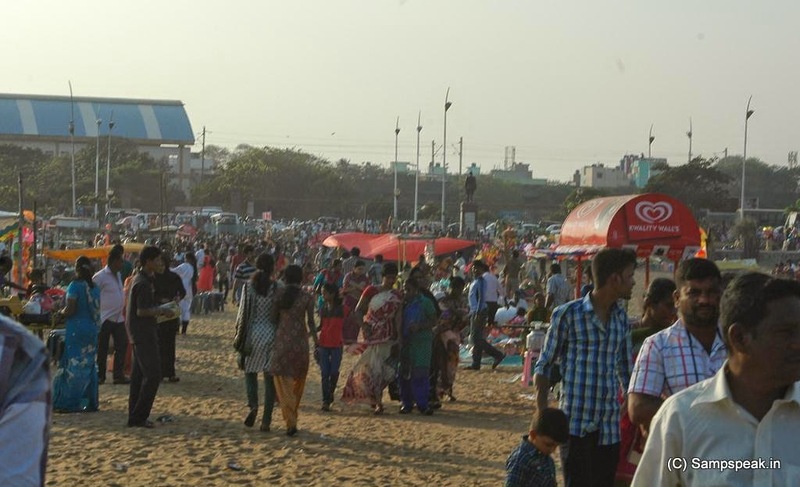 Here are some photos of Marina beach taken by me around 04.30 pm today ~ just the time when people started coming ! when Pigs flew Business Class in Boeing 747 !! whither the quality Indian spinner !! McDonald Pune outlet - pushed out a child ? mail @ in.com closing down !!! White wilderness .............. animal suicide ?